Every year, in the month of Meenam (March-April), a ten day Arattu festival is celebrated at the Janardhana Swamy Temple in Kerala's beach town of Varkala. The Janardhana Swamy Temple is located on a hill, on Beach Road, half way between Varkala town and Varkala beach. It's reached via a long climb of stairs to the top. However, only Hindus are allowed to enter the temple's inner sanctum. 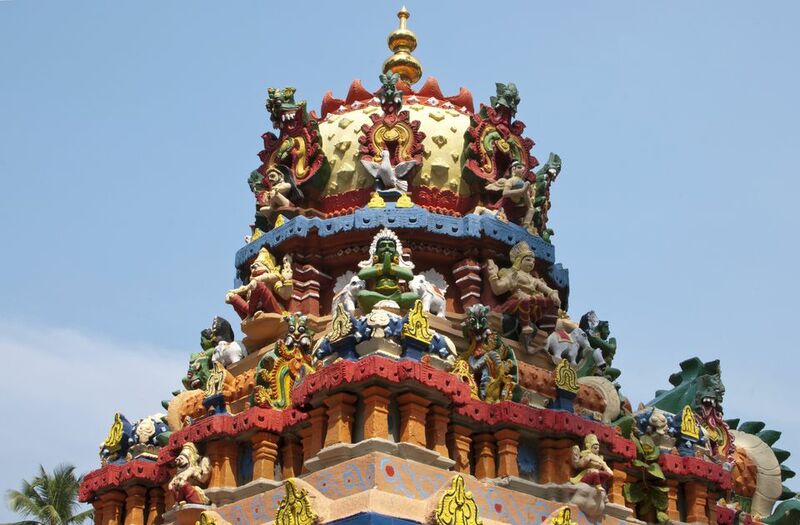 Janardhana Swamy Temple is dedicated to Lord Vishnu and the monkey god Hanuman. The temple is has been an important Hindu pilgrimage site since the 12th Century. All around the temple, there are strikingly crafted and painted images of Lord Hanuman in various poses. Hanuman, the Hindu monkey god of power and strength, helped Lord Rama (a re-incarnation of Lord Vishnu) to rescue his wife Sita from the demon king Ravana. The temple festival starts with a Kodiyettam flag hoisting ceremony, and ends with a procession of decorated elephants through the streets. During the forth and fifth days of the festival, the celebrations include all night long performances such as traditional Kathakali dancing. These colorful photos show the splendor of the festival. Traditional Kathakali dance is a highlight of the Janardhana Swamy Temple festival. On the fourth and fifth days of the temple festival all night performances take place, including traditional Kathakali dancing. Kathakali dance originated in India's state of Kerala in the late 16th Century. It's a classical form of dance-drama that presents stories derived from the Ramayana, the Mahabharata and other Hindu epics, myths and legends. The costumes and make-up are significant part of Kathakali dancing. On the last day of the temple festival, a grand Arrattu procession takes place to add color and excitement. The lavishly decorated elephants are the highlight of the parade. In Kerala, elephants are regarded as a symbol of pomp and prosperity, and no temple festival in the state is complete without them. In addition to providing prestige, the elephants also carry the statue of the temple god during the festival processions. As is customary, all the elephants are decorated with gold plated caparisons (nettipattam), bells and necklaces. People ride on them, often holding tinsel silk parasols (muthukuda), swaying colored tassels (venchamaram), and peacock feather fans (aalvattoam). The procession of elephants at the temple festival is accompanied by ritual drummers and other musicians playing a various instruments. Temple festivals in Kerala are a very noisy affair, with frenzied drumming known as chenda melam. The assembly of musical instruments includes a number of wind instruments, such as the C-shaped brass trumpet (called the kombu), which emphasize and prolong the drumming. After parading around for hours, the musicians finally follow the elephants into the temple. As well as the elephants and musicians, the temple festival parade also has a range of other colorful performers, dressed to reflect various Hindu legends associated with the temple. Performers, dressed as evil spirits, also form part of the temple festival parade. Some of the artists dress up as evil spirits in representation of the legend of Lord Vishnu, the temple's main god, hunting down the demon of evil in the forest. There are some scary characters indeed! This frightening figure represents Garuda, Hinduism's huge mythical eagle. According to Hindu legend, Garuda is a half-man, half-bird figure that carries Lord Vishnu. In the epic Ramayana, Garuda's son helped Hanuman and Lord Rama in the battle to free Sita from the demon king Ravana. There's a great deal of demand for performers dressed as Garuda in Kerala, where a ritual known as Garudan Thookam is popularly undertaken as a way to worship the divine goddess. During the ritual, the performer -- with face painted green, and body complete with attached wings and red beak -- undertakes a special dance. Following this, he strategically inserts a metal hook into his back and swings from a connected rope, wings outstretched. The blood that the performer sheds is viewed as an offering to the goddess.